Pico de gallo. Literally translated as beak of the rooster. Rooster’s beak. What a weird name for a salsa. I’m not sure where the name came from and it really doesn’t make much difference. All you need to know is this stuff is delicious. 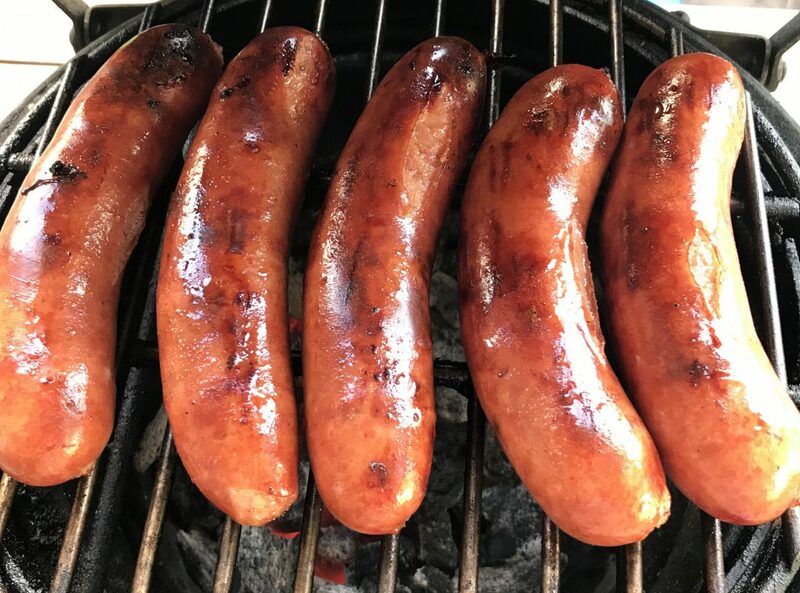 It’s something we grew up eating in South Texas and it is so easy to make. 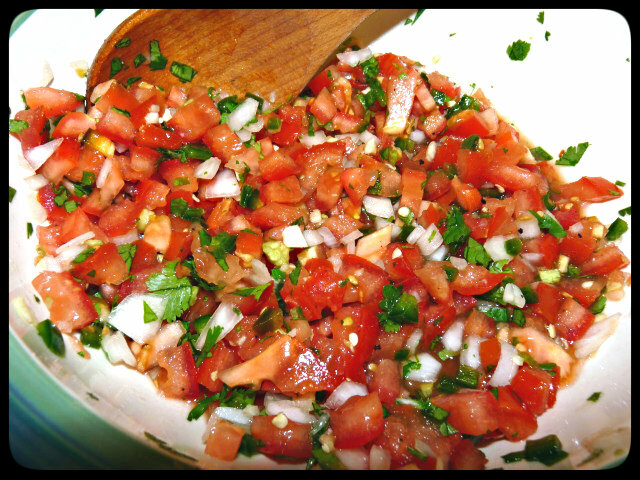 Pico de gallo is generally known as a fresh condiment made from chopped tomato, onion, and chiles (typically serranos or jalapeños). Other ingredients may also be added to the salsa, such as lime juice, cilantro, avocado, cucumber, and radish. The great thing about making your own pico at home, is that you can adjust it to your taste. Want more heat? Throw in more jalapenos or a serrano pepper. Want less heat? Remove the seeds and membranes from the jalapenos before dicing them up. Not a cilantro fan (what, you don’t like cilantro? What’s wrong with you? 😉 ), skip it. Don’t let the picture above fool you. Not all of that went into my pico, I was just laying out the ingredients before getting started. That would have been way too much jalapeno for our household. And only about a 1/4 of that onion went in. And the garlic was playing hide and seek. Ok…I forgot to include some garlic for the picture. You got me. Finely dice up jalapenos. If you like heat, use seeds and all. If you are a bit less heat tolerant, slice jalapenos lengthwise. With a spoon, remove the membrane and seeds and discard, then finely chop up jalapeno. Add to a large, non-reactive bowl. Finely dice up tomatoes, onions and garlic and add to the bowl. Chop up about a 1/4 cup of cilantro and add to the veggies in the bowl. You can add more or less, depending on how you feel about the stuff. Squeeze the juice of one lime over the pico and mix well. Enjoy immediately, or better yet, allow to chill in the fridge for a few hours or overnight to allow the flavors to blend and mingle. How easy is that? And much better than anything you will ever get in a can or jar. Some helpful tips. Not hot enough, add more jalapenos, serranos or hot sauce (like Cholula). Too hot? Try adding another tomato or some sugar to bring that heat level down. Do you like fruit? Try adding mango, watermelon or even strawberries. 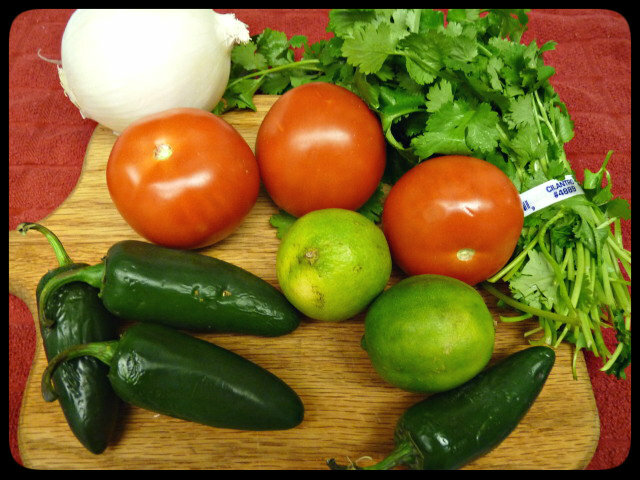 The ingredients listed about are just a starting point that you can use for developing your own personal pico de gallo. Love me some fresh pico — yum! So easy to make and so much better than jarred stuff. NOTHING, beats fresh pico on grilled tacos! You got that right, Mr. Dod. So easy to do, but so rewarding. Topped off some nachos with it. Pico is my preferred “salsa”. I have to have red onion for mine, for some reason. I totally agree. Did some more over Thanksgiving for my in-laws. Huge hit and I used a red onion and I think it does work better.